Daily maid service and mid week linen change. Live like an Emir in this fabulously comfortable castle with panoramic terraces and a superb pool. An intriguing, welcoming, refined and luxurious castle in a location that is central to all that is best of western Sicily, Al Jafar offers wonderful views of the sea, the Egadi Islands and Erice, an ancient walled garden with stunning pool, furnishings and fittings of the highest standard, and discreet, efficient service that is the hallmark of Sicilian hospitality. Inside: accommodation at Al Jafar is spread over three floors of the main castle and at the top of an independently accessed tower. The main entrance leads from a large walled courtyard into a voluminous hallway, whose elegant furnishings, original features, frescoed beamed ceiling and honey-coloured stone walls set the tone for the rest of the property. Off the hallway is a well-equipped Sicilian kitchen with pantry, a guest bathroom, and a splendid living and dining room whose high vaulted ceiling and welcoming fireplace make for a grand yet intimate atmosphere. Steps lead from the hallway up to a mezzanine floor, home to a double-twin bedroom with en-suite shower room. A few more stairs take one up to the first floor proper, where there is a large comfortably furnished living area and library and a beautiful double bedroom with adjacent bathroom with tub, antique maiolica tiles and an elegant aristocratic ambience. The final flight of stairs leads up from the first floor living area up to another large living space and the largest double bedroom, complete with en-suite shower room and an antechamber with a chaise longue. The second floor opens out onto a spectacularly panoramic terrace. Exiting the main house and heading back across the central courtyard, one comes to a tower rising above the impressive entrance gate. Inside, up a 33-step spiral staircase, is the fourth bedroom, a comfortable self-contained double (a small double bed) with en-suite shower room. This little nest is most suitable for independent teenagers or those looking to appreciate the star-gazing skylight. 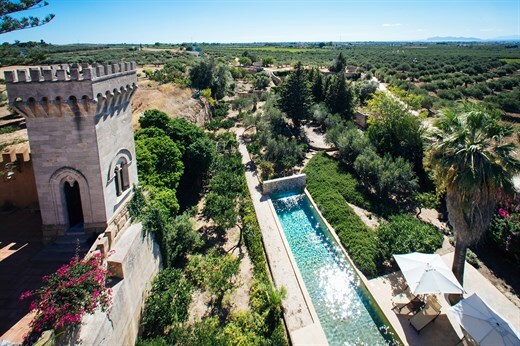 Outside: Al Jafar sits amidst a peaceful, gently whispering 15-acre olive estate. On the ground floor, accessed from the living and dining area and the hallway, is a large panoramic walled courtyard, furnished for relaxing and dining amongst the towers. From here, a stone staircase leads down through the walls to an utterly private Arabic sunken garden. Once a quarry providing tuff stone for the construction of Trapani's baroque churches and palazzi, the garden now hosts an al fresco kitchen with barbecue and dining area, and an enchanting array of flowering plants, pomegranate and other fruit trees, exotic palms and a host of fragrant Mediterranean flora. At its centre sits the fabulous 18 metre-long pool with an advanced chlorine-free saline filtration system, a water feature and feature wall decorated with antique ceramic tiles. The terrace accessed from the second floor landing is probably the best spot for an aperitif, a thesis supported by the presence of dumb waiter connecting it to the kitchen below. This is also where the views are at their best, with 360-degree vistas taking in the surrounding olive groves, the Egadi Islands, the sparkling sea and ancient Erice, perched atop its eponymous mountain. Al Jafar wouldn't be complete without its delicious farm produce, which guests are encouraged to make use of. Its 180 olive trees, some of which are hundreds of years old as is evident from the girth of their trunks and their sheer height (reaching some 10m), produce a superb extra virgin olive oil, and there are also around 40 citrus trees, including orange, mandarin, clementine, lemon, grapefruit and citron, whose zagara blossom perfumes the air at certain times of year. If that weren't enough, there are also plum, apricot, fig, mulberry, pear, quince, medlar and almond trees, free range hens for delicious eggs, and a vegetable garden where heirloom varieties of tomatoes, aubergines, courgettes, artichokes, bell peppers, fava beans, peas and even chick peas are cultivated. Everything is grown without pesticides and no matter the time of year you visit, there'll always be something delicious to use in your cooking. Al Jafar has an excellent ecological pedigree: its solar panels, low energy light bulbs and an eco-friendly water pump system make it virtually self-sufficient, saving some 15,000 tons of CO2 emissions. This house is a restored mediaeval tower and has an intriguing collection of staircases. As a consequence it is not really suitable for very young children or people with mobility restrictions. It would, however, be fabulous for a family with children who are confident with stairs as there is so much to explore! On the second floor antechamber outside the bedroom there is a chaise longue and a fold-out bed that may be used as extra beds for children on request and at a small extra cost. Please let us know at the time of booking if you would like to make use of them. Al Jafar is ideally situated for an exploration of Western Sicily. The nearby towns of Trapani, Erice and Marsala all boast beautifully restored centres with fascinating histories and some great restaurants. The Phoenecian island of Mozia is just a few km away, as are the beautiful salt pans where migrating flamingoes nest. There are a couple of beaches in and around Trapani itself while the one at nearby San Vito Lo Capo is one of the finest anywhere in the Med. A day trip or two to beautiful Favignana and the Egadi Islands is a must: a 15-minute hydrofoil trip and you'll be in an island paradise of beaches, idyllic coves and transparent waters! If all that weren't enough, the dramatic Greek sites of Segesta and Selinunte are within easy striking distance too. The Egadi Islands: 20mins (Favignana and Levanzo) to 1hr (Marettimo) via a regular and cheap hydrofoil service from the port of Trapani. "Al Jafar exceeded our expectations and the staff went 'over and above' to make our stay wonderful. They were really superb because they anticipated our needs before we did and their discreet but excellent service was brilliant and much appreciated." We had a perfect holiday. The staff were fantastic and made our stay unforgettable. We loved it all. The staff were amazing. Of course, I would make arrangements through The Thinking Traveller again. I have and would recommend to friends without reservation. We loved Al Jafar and had a wonderful and memorable family holiday. Al Jafar embraces you. It is an unusual historic property with a beautiful pool area. The tone of the house has a relaxed and serene feeling, aided immeasurably by the staff, whose energy and helpfulness really makes one feel at home. Al Jafar exceeded our expectations and the staff went 'over and above' to make our stay wonderful. They were really superb because they anticipated our needs before we did and their discreet but excellent service was brilliant and much appreciated. Al Jafar is a terrific holiday property. We loved the spaciousness of the house and the kitchen facilities. The caretakers were excellent. The staff were just great! We enjoyed it all. We found the staff to be the perfect couple for our needs. They presented a beautiful breakfast each morning, provided additional service as requested, were always pleasant and charming and were full of helpful information about the area. The staff was excellent, very attentive, thoughtful and fun. They also cooked excellent food. Al Jafar is very well-furnished and everything works well. The BBQ at the pool was useful and we used it twice. The staff had made us a nice dinner on arrival and did breakfast every day. They were discreet and efficient. The whole experience was great. The cooking service was excellent, discreet and good value. The villa was wonderful. Your company was great and extremely well prepared. The whole thing was excellent and faultless. We had a lovely relaxing time... The staff were were very helpful. All excellent... We enjoyed our holiday very much... and were very impressed with your service. We just loved it all... We most enjoyed the house with pool, the staff, the sun, the food and the atmosphere overall. The property was absolutely wonderful - exquisite interiors and beautiful bedlinen. Best of all was the fabulous food that Antonella prepared for us every evening. We ate outside on the terrace making the most of the occasional breeze. The caretakers were an excellent team looking after us - always cheerful and making us feel at home. What a place! The photos don't do it justice... A spectacular experience in a unique home.. Please convey my thanks to the staff, who were so helpful in every way. Really impressed by the experience and thought Al Jafar wonderful. Housekeepers (Nino and Antonella) were great. Al Jafar is a superb property and the owners were very helpful and hospitable. The party that they arranged for us was fantastic and enjoyed by all. Nino and Antonella (the staff) were excellent. Ihr Service ist sehr herzlich und sehr bemüht und effizient/zuverlässig. Genauso sehr gut war das Personal der Villa. Der Eigentümer kam persönlich vorbei und gab uns Tips, da er in der gegend war (sehr netter Herr ! ).